In this book, and Steven’s post, Santa Claus and Satan, the reader is confronted with the most exciting news available to all believers in Jesus Christ. A successful and profitable Christian life is not only possible… it is ensured! How? By simply responding to the words of Jesus to His disciples in the fifteenth chapter of John’s account of the gospel. There Jesus said, “Abide in Me!” He shared with them… and with us, “Make your home in Me.” And for those who refuse? They are left with no hope. 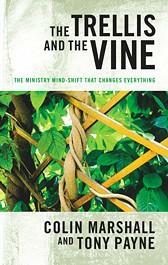 This entry was posted in Books and tagged book, books, Christianity, discipleship, faith, gospel, Jesus, Trellis, Vine. Bookmark the permalink. This puts me in mind of the scripture, “I am the vine; you are the fruit.” The fruit results from choosing the right home! Thank you, Granbee. That may be the most amazing comment I’ve ever received… “The fruit results from choosing the right home!” God bless you good friend! Thank you so much for mentioning and referencing my Santa blog. You’re a big help and a real positive blogger influence for me.